Within the radical left British cultural elite, the mere inefficacy of your futile political campaign is no impediment to its survival – at least, that is, as long as there are receptive media outlets willing to amplify your marginal views. Enter the Guardian – the online home for those engaged in the obsessive, morally hypocritical campaign against Israel. The latest target: London theatres hosting Seret 2015, the London Israeli film and television festival. Anti-Israel activists campaigning against the festival: a couple dozen artists and producers, such as Ken Loach, Peter Kosminsky, Ewa Jasiewicz, Mike Leigh, Miriam Margolyes and John Pilger. We, the below listed artists, producers, and concerned citizens, are disappointed and saddened to see that Curzon, Odeon, Bafta and other cinemas are hosting theLondon Israeli Film and Television Festival. This comes at a time when the global boycott, divestment, and sanctions (BDS) movement against Israel is gaining unprecedented momentum, and the Israeli government is finding itself increasingly isolated for its systematic violation of Palestinian human rights, the Geneva conventions, and international law. It’s unclear how they define “unprecedented momentum”, but since the BDS movement was founded in 2004, noted Gregg Carlstrom (a journalist typically quite critical of Israel) writing in the Global Post, “exports to the European Union have doubled to $15.6 billion per year”. “Foreign investment in Israel“, Carlstrom added, has similarly surged. 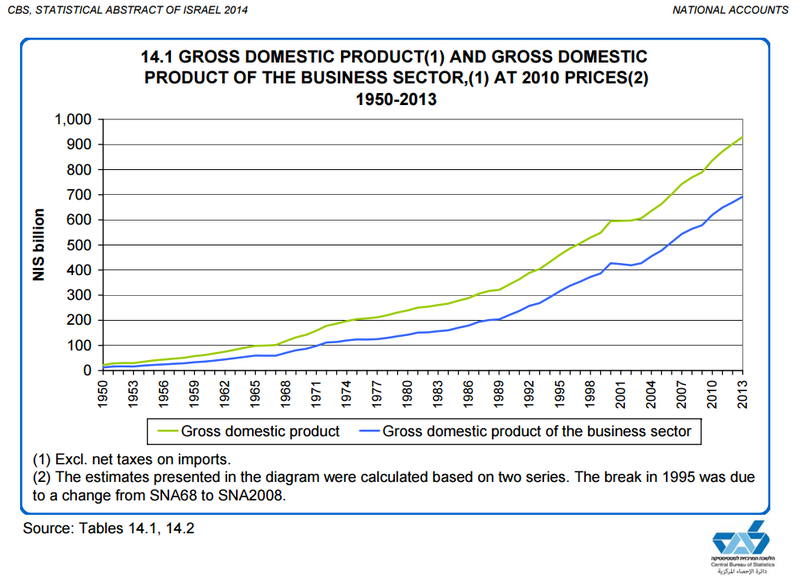 As this graph published by the Israel Central Bureau of Statistics demonstrates, Israel GDP has actually increased at a greater rate since the international BDS movement began than before the campaign. Not to be cute, but we seriously wonder how many people in the UK have even heard of the “2004 call by Palestinians civil society”, yet alone have considered heeding its demands. Are there any statistics which even minimally suggest that your movement has harmed the Israeli economy? Of course, the malevolent efforts by BDS activists to smear Israel as morally beyond the pale, and isolate it internationally, should be taken seriously, and furiously resisted. However, it seems equally true that – despite the best efforts of the Guardian and their ideological fellow travelers – the boycott campaign against the Jewish state is failing miserably. “systematic violation of Palestinian human rights, the Geneva conventions, and international law” – just the usual illiterate bilge. Can’t imagine why there is a question mark in the heading. Nuclear-neutered flies head to Balkans. Millions of Israeli-raised sterile insects primed to go into battle against the Mediterranean fruit fly, which has been wreaking havoc in citrus groves…. The company growing the sterilized flies, BioBee from Sde Eliyahu in the Jordan Valley, specializes in developing natural and bio-friendly pesticides. It recently won a tender by the International Atomic Energy Agency to supply 400 million sterile flies, following a successful project conducted last year…. The UN IAEA supports the project as part of its plan to encourage use of nuclear technologies for peaceful purposes. BioBee won the tender despite competing with a Spanish firm which has won a similar deal in the same region in Eastern Europe in the past. Palestinian civil society is an contradictio in adiecto unless Al Guardian considers the term civil society is fitting terror supporters. If so, it whther offes an Orwellllian understanding of civil society or unveils an till now hidden truth of what civil society is up to. As has often been said BDS harms Palestinians most. There is talk that Ahava may move its plant which of course, like SodaStream, means that many Arabs will be out of work. The Beguile, Deceive, and Sham bullies don’t care about that. British Business Secretary Says Israel-UK Trade Ushering in ‘Golden Era’. And the fellow is a proud Muslim… Obviously he doesn’t read dthe Guardian.